1. Combine half the lemon juice and all the zest in a large bowl. Halve the fennel bulb, remove the core, then slice thinly. Combine with the lemon juice and zest, add a good pinch of salt and toss to coat. Quarter, core and thinly slice the apple and add to the bowl. Toss everything together then set aside for 10 minutes. 2. Meanwhile, bring a large pan of water to the boil, add the asparagus and cook for 4 minutes. Drain and refresh under cold running water. Slice the asparagus in half lengthways then add to the bowl, along with the radishes and watercress, and toss to combine. 3. For the dressing, whisk together the remaining lemon juice with the crème fraîche, horseradish and oil. Whisk in enough cold water to loosen to the consistency of double cream. 4. Spread a little of the dressing onto four serving plates and pile the salad on top. 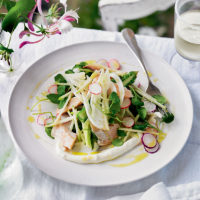 Flake the trout over the salad and drizzle with the remaining dressing.